How high will she go? Gotta pay for illegals, gotta pay for HC, gotta pay for green house gas emissions, gotta bail out GM, gotta bail out the banks, gotta be the policemen of the world. It never stops and some people keep thinking we need to keep voting these fucks back into office. $25,400 per person when including state and local taxes. Beyond out of control. Ave almost 5% increase a year since 2000. Over $2200 PER PERSON just on defense. That's fucked. 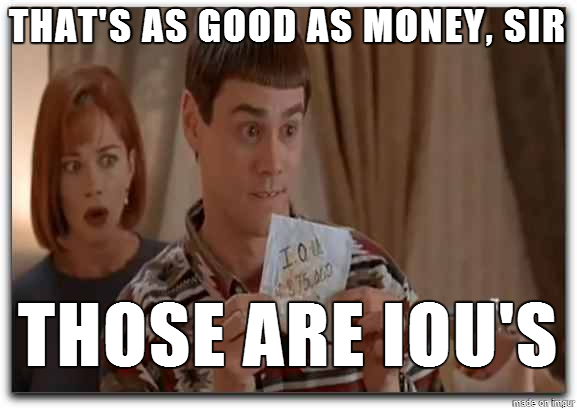 Nah, I O U's are just fine. Nobody cares, just keep trucking! I'm sure the budget will balance itself soon. They should implement a one time buyout. Pay for your share of the debt and you don't have to pay taxes for the rest of your life. Then we invade canadastan and take their oil to pay the rest. I like it. While we are at it, we can disband all Canadian hockey teams just out of spite. Gubbermint spending at the , local , state and federal levels have been out of control for decades. Next time you see a baby buster , say thanks . The county I live in has a balanced budget.